Awhile back, I wrote about the “The Reasons We Shop Too Much” and recently shared a more personal perspective in “Why Continue to Shop?” Today I’d like to look at how our compulsive shopping affects our spouses and loved ones. Many shopaholics, who may be honest and trustworthy in other areas of our lives, engage in lying and hiding behaviors to cover up the fact that we shop too much. In “The Serial Return Phenomenon,” I wrote about how compulsive shoppers return items we buy as a means of extending our shopping. The returns fund future buying excursions and allow the shopaholic to get another “fix.” The following are some other duplicitous behaviors commonly committed by compulsive shoppers, myself included. Has your spouse ever complimented something you were wearing and asked if it was new? Did you tell a “little white lie” and say you’ve had it for ages, even if you just bought it last week? If so, you’re definitely not alone! Many of us find those white lies just roll off our tongues without any malice of forethought. A variation on the “this old thing” theme is when we say something was a gift or a hand-me-down when we actually picked it up at Nordstrom just the other day. If we actually do cop to having bought something new, we might deflate the item’s price by saying, “It was on sale” or “It was an amazing deal,” even if we purchased it at full price. Do you leave bags in the trunk of your car when you see your spouse’s car in the driveway? Do you shove the new top you just bought into your purse rather than carry a shopping bag inside your house? How about stashing new items in your kid’s closet or the spare bathroom cabinet so as to remove the evidence from view? Hiding purchases is a common behavior of shopaholics and one I’ve engaged in many times. Not long ago, however, I got caught. I came home from a shopping trip and my husband wasn’t there, so I went out to the car to bring my bags into the house. Well, it turned out he was not far behind me and saw me with the bags! Needless to say, I had some ‘splaining to do! For most of my marriage, I’ve been in charge of our personal financial accounts. I’m highly detail-oriented (as you’ve probably noticed) and I had more time on my hands, so it made sense for me to manage the household finances. In almost all respects, my accounting was impeccable, but occasionally I’d enter a purchase in the wrong category in QuickBooks. 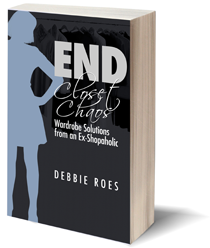 Something that should have been listed under “Debbie’s Clothing” somehow got placed under “Gifts” instead. Imagine that! Another popular maneuver was a bit less shady. I actually would buy a gift for someone, but I’d also throw in a “little something” for myself for good measure. Then I’d just “forget” to split things out when I updated the accounts. In the “white lie” column under creative accounting are date changes. If I exceeded my shopping budget for one month, I’d enter the extra purchases in the following month. Of course, I was always “behind the 8-ball” in terms of my budget and never seemed to be able to catch up! The examples above are just a few ways compulsive shoppers hide their spending by means of the financial planning tools we’ve come to rely upon. Some shopaholics also open secret accounts or get paid “under the table” for freelance work and use their covert funds to finance shopping sprees. I’m sure there are other covert accounting operations I haven’t mentioned, but you get the idea. This behavior is an offshoot of creative accounting, but since I’ve used it so often, I decided it needed its own category. Instead of using a credit card for my shopping or alterations expenditures, I’d use cash. Consequently, those expenses wouldn’t fall under my shopping budget and I would appear to doing better with my shopping than I really was. Buying with cash is something I’ve done in the very recent past, so I’m “outing” myself by writing about it here. The numbers I reported in “The Cold, Hard Facts: Finances” and in my monthly accountability posts are all at least somewhat “off” because my cash-based shopping was not included in the reported numbers. How off? It’s hard to say, but it may be as much as 15-20%, which is not trivial! A variation on this theme is shopping at charity thrift stores. Since such establishments benefit legitimate charities, I would categorize the shopping done there under the Charity budget category instead of the Clothing bucket. Of course, the money did go to a “good cause,” but I was still being dishonest to my husband by not admitting the truth of how the money was actually spent. The final area I’m covering (not that there aren’t more areas of dishonesty to address) is deflection and placation. These are the behaviors of which I’m the least proud. There were many times when my husband would confront me about my shopping problem and I really did know it was an issue. But instead of being sufficiently remorseful and willing to change, I would often placate him with empty promises. I’d promise to do better and stick to my budget, all the while internally scheming about how I could continue to shop. Another common tactic would be to deflect the focus of the conversation away from my shopping and onto areas where he spends a lot of money or the financial mistakes he’s made. While he doesn’t have a flawless financial history (who does? ), his issues really weren’t the point and I knew it. I just didn’t want to talk about my shopping and I used my communication prowess to shift the focus away from me. Not a good thing to do to a wonderful man who has always been unflinchingly supportive of me and my life pursuits. 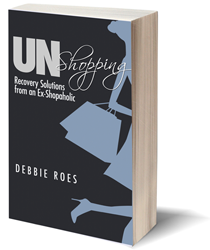 You may identify with all of my examples of covert shopaholic operations or just a few. My list is probably not comprehensive, but it does include the more common ways compulsive shoppers deceive their loved ones in order to continue shopping. How do we overcome these duplicitous behaviors? I feel the first step is to come clean, as I just have. As with many things in life, the truth shall set you free. Telling the truth may not make everything better, but it does start us on the road back to honesty – and to being our best possible selves. This entry was posted in Behavior & Psychology. Bookmark the permalink. just yesterday evening I was thinking about how relationships work out with a compulsive shopper, and here you bring this whole issue to the fore. This is very insightful and thought provoking since I tend to have very much a ‘comon sense’ approach to life as in: if it doesn’t work, don’t continue doing it . That is not to say that I have never overspent or made unnecessary purchases, but it has always been within reasonable perimeters. My least disciplined area of life was my love for wine, and I am working on that right now. You mentioned in another post that going cold turkey is easier than moderation. Why is it that I have no problem not drinking any wine, but after one glass, I will want a second and sometimes third? And yes, I will do better not even opening any Eileen Fisher email because most of the time I will find something that I think I can’t do without. You have made great strides in articulating the reason and emotions behind shopping and I continue to wish you all the best. I enjoy following the blog and your journey. Cornelia, Thank you for your kind words and continued encouragement! Congrats on making positive strides regarding the wine. I’m doing the same with coffee. Somehow facing my shopping demons has given me strength to tackle other issues. I couldn’t do the coffee cold turkey, nor would I really want to. Same with the shopping. I don’t want to never shop or never drink coffee; I just don’t want those things to overrun my life! Sarah, Welcome and thanks for your comment! Congrats on doing well with your wardrobe and spending. I hope to get there sometime soon. I’m no longer dishonest with my husband and that feels really good. He deserves my honesty and I’m happy to be honoring him and myself more now. For those of us who engage in the things you mention here, this was a tough post to read. It’s amazing how I pride myself on being such an honest person in most situations, yet I have done everything here and more. All the while fooling myself into thinking I didn’t have a problem because I didn’t use credit cards and it was really just a fun hobby combing second-hand shops weekly to dress my house and myself “on the cheap” Ha! The thrill of the hunt sucked me in and all the lying to my husband and myself must stop! I’m happy to say I did finally reveal all to him last week and feel so free having the truth exposed. One thing I’ve noticed though, and maybe you can address this sometime, is that buying anything that isn’t a necessity arouses a lot of guilt once the $ is spent even though we can afford it without debt. I know many people shop for things they don’t need guilt-free….I wonder if I’ll ever be able to. 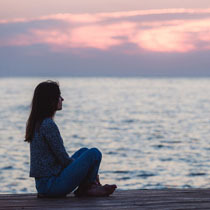 Thank you for your blog Debbie…it is helping me so much, and I no longer feel so alone as I battle to recover from this addiction once and for all. Molly, Welcome and thanks for your comment! I’m glad my blog is helping you to not feel so alone. It is actually doing the same for me and I appreciate all of my readers so much! This was a difficult post for me to write and I pondered it for a few months before actually writing it. It was on my idea list for awhile, but I finally decided to take the plunge. Congrats on coming clean with your husband. It DOES feel free to tell the truth and it’s an important step toward recovery. What you mentioned about buying guilt is definitely a good post topic. The whole need/want issue relates to guilt. My mom used to tell me I didn’t need things and shouldn’t buy them. I guess I “showed” her, didn’t I? I know I’ve done the gift thing! I haven’t lied to my husband, but I didn’t volunteer anything either. We both ignored a lot of things in the past. Now to keep myself from falling back into old habits I probably tell him way more than he ever wanted to know. Maybe someday it will feel natural to not overspend, but right now I feel like I have to be hyper vigilant. Reading all of your posts about this issue has really made me pause and think about what it must be like to have shared finances. I don’t think I would like it at all! I’ve always been in relationships where we kept our money separate, so I never felt I had to lie or conceal anything about my shopping habits. As long as I could pay for it, I could buy whatever I wanted. (Also my partner was way more of a shopper than me–I never knew what he was going to show up at home with!) So reading about this kind of subterfuge is something I’ve never considered before, and now I am sitting here wondering how would I fare in a situation of shared finances? I’m pretty sure if I had to share that I would insist on being the one who managed the finances. I can’t imagine it any other way, given my family background and personality. My parents were unique in that they firmly believed in keeping their money separate. They both worked full time when I was growing up, and I remember many times seeing them sit at the kitchen table going over house bills and each contributing their half. They thought that was the fair way to do things. The first two points you made really hit home for me. Those are the two sins I commit the most. Even though I support our family, have no debt and a good amount of savings, I still feel ashamed knowing how much secrecy was engaged in concealing my shopping addiction. If my husband and friends had any idea how much I’ve wasted on clothes and accessories that I ended up getting rid of, they would probably think I’m leading a double life, and they would be right. It really is like being another person where all those addictive emotions comes over me and I just need to buy these things I simply do not need and quickly realizing I don’t actually want either. I think the worst part are the lies I tell myself every time I crack out that credit card or click purchase. Your blog does help to remind me that I’m not alone in this and I’ve almost completely stopped looking at fashion blogs all together. (they are the worst offenders for me) I still have to find my own way to battle the urges. I’ve tried all the advice that’s out there! Wendy, Glad you found this post helpful. It was kind of hard for me to write, as I had to “out” myself and my unsavory behavior. But I knew that others struggle with similar issues. Telling the truth about our behaviors (first to ourselves and then to others) is an important step in recovery, I feel, but we have to forgive ourselves for our past mistakes. It won’t do us any good to beat ourselves up over wasted money, dishonesty, and the like. We just need to vow to do better and do our best to make better choices. Congrats on cutting out the fashion blogs! I’m gradually letting those go as well, and it’s helping to quiet the “wanting machine.” I’ve tried much of the advice out there, too, and have continued to struggle. Opening up through my blog is helping in a way that nothing else did. I encourage you to comment again! This is a safe place among others who understand our struggle. We CAN overcome our compulsive shopping problems! I got to thinking about my earlier post about shopping subterfuge and while I never had to hide my purchases from my partner, in the past year, I realized I have had to sneak them past my Mom who lives with us since my dad passed away last year! In our house, you can’t get upstairs without walking past Mom’s room on the first floor. She keeps her door open so she can feel involved in the activities of the household (Mom is physically disabled). So whenever I bring in “questionable” bags, I sneak them upstairs when she is otherwise occupied. Way to feel like a teenager, lol! Deby, Well I didn’t say the subterfuge always involved a spouse or partner 🙂 Fun story! I would probably want to hide the bags from my mom, too. I don’t hide from anyone anymore, but it took me a while to get there. Thanks for your comment! I’m glad you like my blog and received value from this post. Some of these behaviors are hitting the nail on the head for me. Hiding bags, check. Lying that a new item isn’t new, check. Using my weekly ‘spending money’ for clothing purchases, check. It’s amazing the things we do to support a bad habit. I had to purchase a pocket calendar and mark everyday I shopped, for me to realize how often I was shopping. Then it became a game, how many days could I go before I shopped. Two days? Four days? The longest I’ve done in two years so far, is 30 days. But progress is progress, even if it is small right? Great idea to note on the calendar when you shopped. Did you include online “browsing,” too. I used to shop in some way every single day and often for hours. Now I have a lot of days when I don’t shop, but I don’t know how many in a row. I don’t know if I’ve ever reached 30 if I count the online stuff… I think 30 days is impressive and you should feel proud! You can continue to build upon that moving forward. Online browsing, hmm I never considered tracking that too, a great idea! I’m a big brick and mortar store shopper. Since I sit at a desk all day for work, it makes me feel like I am getting exercise when I wander around a store. But that’s just going into the lion’s den, I cannot ‘just browse’ right now, too easy to make a purchase so I just try to stay away from the stores and be more vigilant about shopping with lists. I prefer the brick and mortar shopping, too, because I’m at home so much of the time and I like to get out. But I’m doing more online shopping these days, both to avoid the “lion’s den” and to increase my chances of finding the specific items I’m looking for (it’s amazing how hard it’s been to find a grey skirt and black jeans, for instance). Of course, then there’s the almost inevitable returns, but I’m doing what I have to do in order to shop smarter.